[Hong Kong, 14 December 2018] As Hong Kong’s largest applied research and development centre, the Hong Kong Applied Science and Technology Research Institute (ASTRI) has a mission to enhance Hong Kong’s competitiveness in technology-based industries through applied research. The Institute today hosted the ASTRI Technovation Summit 2018 that brought together over 30 thought leaders and experts from Government agencies, research community and the industry. Exploring ideas and sharing experiences on a smart future for our city empowered by AI, the Summit attracted over 400 experts, entrepreneurs and top-level executives from across the industry to explore opportunities in driving a smart, innovation-led Hong Kong. In his opening remarks, Mr Nicholas W Yang, GBS, JP, Secretary for Innovation and Technology said that “Artificial Intelligence is an important technology area unlocking a whole new world of potential and Hong Kong definitely has an edge in developing AI. We are working at full steam to build the research cluster ‘AIR@InnoHK’ focusing on AI and robotics technologies in Hong Kong Science Park. We will continue to render full support under the Innovation and Technology Fund to finance applied R&D projects on AI. 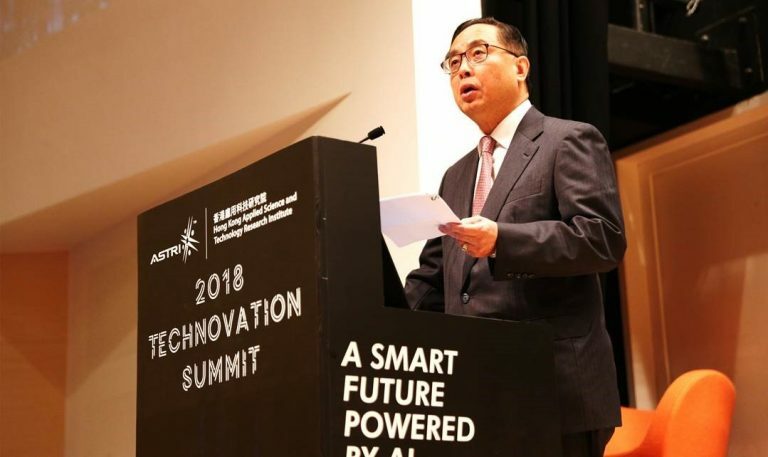 The Government will also lead by example by adopting AI to improve public services.” With the concerted efforts of the industry, academia, R&D centres and the Government, “Hong Kong would be playing a crucial role in developing more AI applications to bring better life for our citizens in the future,” Mr Yang added. The day-long summit featured seven keynote presentations and five panel discussions. Speakers included the Honourable Mr Charles Mok, JP, Legislative Council Member; Mr Jason Pun, Assistant Government Chief Information Officer; Ms Esther Wong, Managing Director of Strategic Investments of SenseTime; Dr Winnie Tang, Founding and Honorary President of Hong Kong Smart City Consortium; and Professor Henry Chung from the Department of Electronic Engineering of the City University of Hong Kong. In his presentation, Mr Hugh Chow, Chief Executive Officer of ASTRI shared the experience and insights from ASTRI’s innovation journey, and the role it plays in supporting Hong Kong’s I&T and Smart City development endeavours. The panel discussions focused on applications of AI and next generation communications technologies across a wide variety of sectors, such as ‘smart government’, ‘smart mobility’, ‘cybersecurity’ and ‘smart manufacturing’. The panellists represented public sector institutions and government departments such as Hong Kong Monetary Authority, Hong Kong Science and Technology Parks Corporation, Hong Kong Cyberport Management Company Limited, Hong Kong Police Force, Water Supplies Department, Hong Kong Fire Services Department, and Customs and Excise Department. Academic and private sectors were represented by HKT, Standard Chartered Bank, TNG, Octopus, Nova, Marvel Digital, Huawei, Master Concept, Profit Peak and Smart Secure ID. The Summit wrapped up with a panel discussion by former ASTRI members – ASTRIANs – who left the Institute but continue to contribute to the advancement of I&T either from other organisations of through their own ventures. The ‘ASTRIANs: Brightest Minds, Powerful Impacts’ session covered how innovative ideas incubated in ASTRI turned into inspirational ‘Made in Hong Kong success’ stories. ASTRI Alumni Network – or ASTRIAN – is an important initiative that bridges ASTRI and its current team with alumni members, seeking to maximise the support offered to past and present team members while also leveraging the collective professional strength of the alumni community. 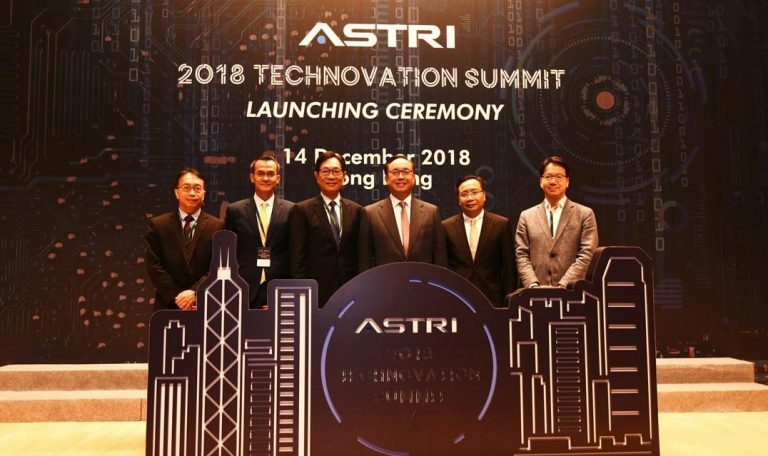 ASTRI Technovation Summit 2018 sought to facilitate meaningful dialogues and impactful collaborations for Hong Kong’s advancement in the I&T sector and its overall Smart City development. The Summit’s speakers unanimously called for more traction in AI-based research and active commercialisation of smart technologies in Hong Kong, predicting robust economic development and improved quality of residents’ lives.